1x Brain Octane Oil – 473 ml / 16 oz. Bulletproof Brain Octane is refined and created through a proprietary process using only heat, water, pressure and earthen clay. No harsh chemicals are used in the production of our oils. Make and drink Bulletproof(R) Coffee for a high-performance day. Energize, perform and focus with the Bulletproof Coffee Recipe. Feel the Bulletproof difference with your first cup. Start with 8 fl oz (237 ml) of filtered water, fresh off the boil. Add 2 1/2 tablespoons (37 ml) freshly ground Bulletproof Upgraded Coffee Beans and brew using your favorite method. 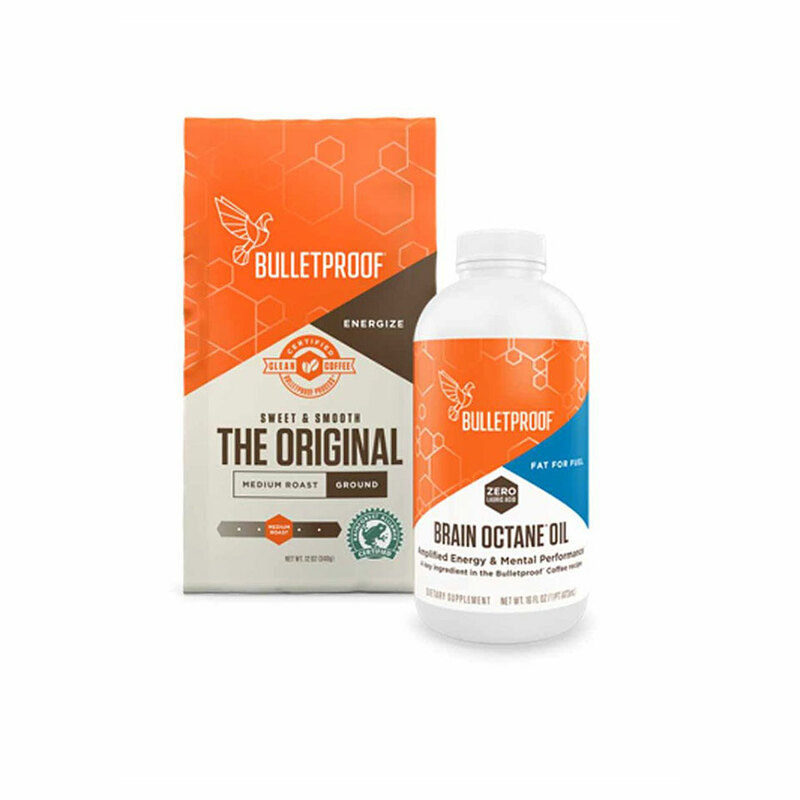 If you’re new to Bulletproof Coffee, add 1 tablespoon (5 ml) Bulletproof Brain Octane to 8 oz (237 ml) of hot coffee. Gradually increase the amount each day as desired to reach 1-2 tablespoons (15-30 ml) per cup. Add 1-2 tablespoons (15-30 ml) grass-fed, unsalted butter. Mix it all in a blender for 20-30 seconds until it is frothy. Note: With our Upgraded Kits, we provide maximum value by automatically including a great discount on each item contained in the kit. For this reason, our kits do not qualify for additional discounts and coupons. A Verified Reviewer is a shopper who has confirmed an email address, or connected a social network, providing an added level of transparency and trust. I have been drinking bulletproof coffee for 1 year now and am so thankful to have found the podcast. I feel more energy, more focus and more productive. This was a great combo package. Moreover, I was accidentally charged twice and received two packages of this combo. The Bulletproof team refunded me for the second purchase and let me keep both packages! This of course won me over and I’m back for more! This is of great value getting high quality coffee and Octane oil. I look forward to this every morning! Amazing product! I will never drink another coffee! wish I knew about this years ago! I love my bulletproof coffee. I feel full until around 2pm everyday and it feels good! 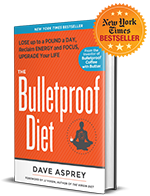 I used to be so consumed with food and felt like I needed to eat every two hours, so I really enjoy the effects of bulletproof. Beside the health benefits, I also like how this product tastes and how the packaging is made.The support was very helpful in many cases ???? I started drinking Bulletproof Coffee over a year ago. I’ve loved it ever since. I had a baby this past Thanksgiving. The first part of my very necessary daily routine is making my coffee as soon as I get up . I literally feel lost without it. It gets my day off to a great start and I love not feeling any kind of crash. EXCELLENT START TO THE DAY! I have been beginning my day with Bulletproof coffee and a can of sardines for about a year now, and the stable energy and focus are terrific. I am always testing and tweaking my routines for maximized efficiency and performance, and Bulletproof coffee with grass-fed butter, Brain Octane, and XCT Oil have become a cornerstone in my morning. I’ve had an ongoing subscription for this kit for about a year. It’s the best way to stay organized and not run out of Bulletproof coffee and Brain Octane Oil. I also save with the discount for a standing order. This is my third year drinking Bulletproof coffee. My mornings are perfect, my weight stabilized and my thinking more clear. A big shout out to Bulletproof!!! Bulletproof coffee is amazing. I’ve had a cup nearly every morning for the past 2 years and the difference it makes on my energy levels, mood, and the reduction in food cravings and hunger is profound. The kit is a perfect way to get everything you need. Feel free to contact us via phone or mail. Biohack.ae Special Limited Time Offer!